But here’s a new garlic discovery I hope you will make use of: Researchers have discovered why freshly crushed garlic protects your heart. That garlic has health benefits is nothing new. Since at least 1500 BC, healers in China and India have used the odiferous bulb as a blood thinner. Hippocrates, the father of modern medicine, used it to treat cervical cancer. Louis Pasteur reported on garlic’s antibacterial and antifungal powers, which inspired Albert Schweitzer to use it against dysentery in Africa. But now, a team of researchers from the Cardiovascular Research Center at the University of Connecticut School of Medicine have learned how freshly crushed garlic—as opposed to dried or cooked garlic—protects the heart. Why is fresh garlic better? Because the hydrogen sulfide is a short-lived gas, it disappears when garlic is dried, processed, or cooked, he adds. Dried or processed garlic does retain its antioxidant effects, however, and helps protect against free radical damage—but not to the extent that fresh garlic does. In the study, published in the August 12 issue of the Journal of Agricultural and Food Chemistry, the scientists gave freshly crushed garlic and dried garlic to two groups of lab rats, then studied how well the animals’ hearts recovered from simulated heart attacks. “Both fresh and processed garlic reduced damage from lack of oxygen, but the fresh garlic had a significantly greater effect on restoring good blood flow in the aorta, and it increased pressure in the heart’s left ventricle,” Das says. 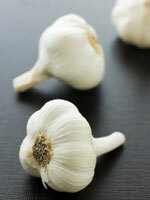 The amount of garlic you need to get the heart-healthy benefits is about a clove a day. According to Herbal Therapy & Supplements, a handy guide by herbalists David Winston and Merrily A. Kuhn, RN, PhD, the best way to use garlic is to mince a clove, let it stand 10 to 15 minutes, then mix it with yogurt, applesauce, honey, or some other carrier agent. If you eat some parsley afterward, it will help control garlic breath.